Summer holidays are here and everything is perfect! Johan just got back from his high school's football program, he is practicing, competing with the old team and meeting his girl Ella. Could life get any better?! Yes, actually it can! Johan gets picked to join the national youth team and all of a sudden perhaps his dreams of going pro will come true. Although he will soon come to realize that there will be difficulties served alongside the success. 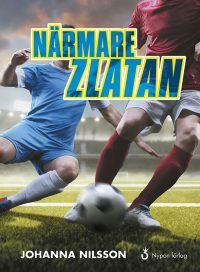 Closer to Zlatan is the fourth book in the series about Johan. Johan's whole world evolves around football. He dreams of becoming a pro like Zlatan and play for the national team. Johanna Nilsson's books about the football-crazy Johan is a winner! The books are absolutely adored by the readers . The first book in the series won the Book jury "Bokjuryns" price in 2015 for best young adult. Johanna writes about the games and practices of football but she also brings up other aspects of the sport. "It's almost strange how easily you float through Johanna Nilsson's books about Johan who plans to become a football pro. Four books have been published. Johan has taken a few wobbly steps closer towards the dream. Although what he thinks will be easy and chill turns out to not be a breeze. People he doesn't know wishes to become his friend. He gets invitations to parties he doesn't want to attend. His mother who used to be worried about his choice of profession starts to post news papers adds about him on the refrigerator. And worst of all, Ella doesn't wish to speak with him any more. Is it over? Luckily he has Anna who also plays football. He can share his problems with her. His dad I also a person he can rely on, he listens. A successful football tournament in Finland leads to a contract with Manchester United, and a move to England. His relationship with Ella is put to test. The fact that his friend Hamid is hurt and is resting in a hospital bed is another worry that spices up this exceedingly well written and delicately wonderful book. A book which theme might not primarily be football, even though Johan plays as a God. The theme is about change and how to stay true to who you are. "